Recently, Illinois became the tenth premier university to honor Nikola Tesla through a unique, grassroots effort to recognize the prolific inventor. Retired Michigan school teacher John Wagner presented a bust of Nikola Tesla to the ECE Department in a ceremony last month in the student lounge (167 Everitt). 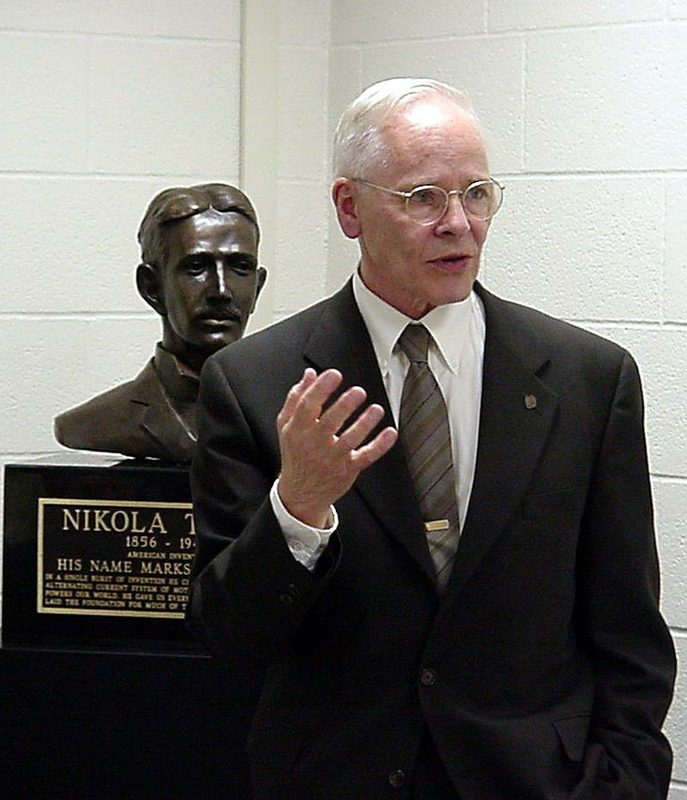 Retired Michigan school teacher John Wagner talks with the audience after unveiling the bust of Nikola Tesla in 167 Everitt Lab on September 10, 2002. Wagner's third and fourth grade students have donated 10 busts of Tesla to major universities. The inscription reads, "In a single burst of invention he created the polyphase alternating current system of motors and generators that powers our world. He gave us every essential of radio, and laid the foundation for much of today's technology." Wagner, who taught third and fourth grade, became a Tesla enthusiast in 1983 after reading John O’Neill’s 1944 biography “Prodigal Genius: The Life of Nikola Tesla.” This biography inspired Wagner to use Tesla as a focus for his English composition classes. Since then, generations of third and fourth graders have been working to give Nikola Tesla the recognition he deserves. A father of one of Warner’s former students offered to sculpt a bust of Tesla for the class. Since then, the students have sold Tesla T-shirts and solicited donations to pay for 10 busts, which are given to major universities across the United States. According to Wagner, the original intent was to donate a bust to the Smithsonian Institute. However, when the Smithsonian turned down the bust “in deference to their industrial donors,” the students decided that the busts should be placed in the top universities in the country so scholars would recognize the value of Tesla’s contributions to the electrical power and communications industries. With more than 100 patents, Tesla developed the first practical methods for using alternating current, which enabled the long-distance transmission of electricity. He created the “Tesla coil,” a popular device for demonstrating high frequency and high voltage phenomena. He designed new electric lighting systems and incandescent lamps. Tesla also revolutionized the field of radio communications with a four-circuit transmitter/receiver and novel designs for amplifying and transforming signals. Uninterested in turning his inventions into profit, Tesla instead focused on his research work. He died in 1943 at the age of 86. Though now retired, Wagner still volunteers his time in two local elementary schools and still inspires students to enhance Tesla’s reputation. More information on Wagner’s and his students’ efforts, as well as information on the T-shirts, is available on Wagner’s Web page at www.ntesla.org/index.php.